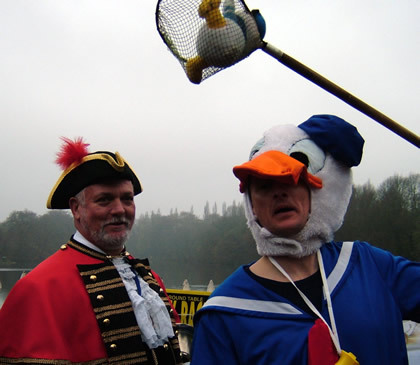 Lymm and District Round Table hosted another Easter Monday Duck Race. The only known event to take place in the country! started the race at Lymm Dam, aided by the Stockton Heath Fire Brigade. The race was close, a large crowd waited in anticipation; some of the ducks became tired and took along time to swim down to the lower Dam. Some became stuck and needed assistance from a passing canoe! Daisy and Donald Duck Alias Steve Robinson and Gary Mogey, kept the crowd entertained with there commentary on such a nail bitingly close race! The Lymm and District Round Table raise funds for various local charities; a team of them are training at the moment to run in the Great North Run in September 2004. Thanks to all the Corporate Sponsors for their generous donations. The corporate ducks were very slow this year! Possibly discussing the house prices in Lymm, or may be the need for a drink! No: 11 The Railway, duck looked like it was winning, but at the end of the race none of the Corporate ducks were any where to be seen! They must have gone for that drink after all! However the public ducks swam well to the cheers and quacks from the crowd! 3rd prize No: 388 - All winning Easter Eggs.